Product Name: Disposable Automatic Retractable Safety Syringe with fixed needle. Specification of syringe: 0.5ml, 1ml, 3ml, 5ml, 10ml. Specification of needle: 30G, 29G, 27G, 26G, 25G, 24G, 23G, 22G, 21G, 20G. Safety feature operates with one hand. Protects the patient and medical staff once the needle is retracted. The needle will remain sharp after puncturing the stopper on the medicine vial up to three times. 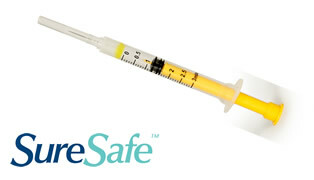 SureSafe™ Safety Syringe w/needle is used for subcutaneous (Sub-Q), Intramuscular (IM) and Intravenous (IV) injection. The safety mechanism is designed to automatically retract the needle into the plunger after injection to aid in the protection of an accidental needle stick and secondary use. Clinicians should be familiar with the Instructions for Use and be trained in the administration of Sub-Q, IM and IV injection. The proper steps for use are as outlined below, as per your established protocols. Peel-open the blister pack and remove the protective cap from the needle. lnsert the needle into the medicine vial to draw medication into the barrel. After medicine is fully discharged an audible/tactile “click” will occur when the needle engages with the automatic mechanism, continue to push the plunger until the needle automatically retracts into the plunger body. Place syringe in a suitable sharps container for safe disposal. Please read the instructions for Use before using. Do not use if package is damaged or protective cap is detached. Do not push the plunger over the “warning line” before injection to prevent early retraction activation. Automatic Retraction Safety features can be only activated after the medicine or fluid is fully discharged. Do not pull back the plunger before the medicine or fluid is fully discharged. Should the needle not retract automatically it can be manually retracted by pulling back on the plunger, once the shaft has gripped the needle hub. Check if there is a shaft at the top of the plunger before use. Do not use if the shaft is missing. Store in a cool dry, ventilated area, out of direct sunlight.